With those with a hard bone structure, you are going to want to soften them a bit by applying rounded bits of blush to the center of the cheeks. This is going to help your eyes look as if they are wider and your entire face will look fuller. Those who have a prominent chin, it is best to put the blush to the lower part of the face, near the chin. With this look, you are going to show others that your cheeks rest a bit lower and you are going to create a balanced look about you. This is perfect when you are in a professional setting. Some people love to full big blush on the cheeks. This is going to show that you are not afraid to take risks. For women who have a fuller face, this is going to shorten it significantly and create a better shape to it as well. This is a daring look and not everyone can pull it off. When looking for the best look, it is best to try all methods to see which is going to be the best one for you in particular. Blush is a very important makeup necessity and it will give you more confidence in your beauty. 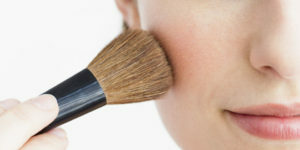 There are many things which you can do to make yourself look pretty and blush is one that you must not forget.